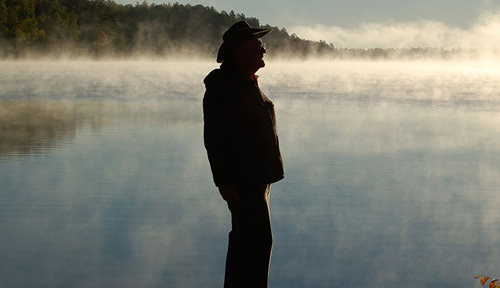 Review: Running Wild / It's Just Movies Review: "Running Wild: The Life of Dayton O. Hyde"
In 1988, at age 65, Dayton Hyde looked at his life and asked himself what he really wanted to do. Then he gathered his credit cards, applied for a loan and left his wife and family on their Oregon ranch and headed to South Dakota. There Hyde bought 11,000 acres and settled in with 500 wild horses. This isn’t advised for everyone and his family members still choke up when asked about it. But what Hyde ended up doing was revolutionary and for the greater good of America’s precious ecosystem. With his 11,000 acres he created the Black Hills Wild Horse Sanctuary where wild horses can freely range for perpetuity. This film is about the odyssey of Hyde and how he grew up on an isolated lake in Michigan during The Great Depression with a father confined to a wheelchair because of multiple sclerosis. His interests were in the life about him: the birds, the wildlife and the land. One day his uncle wrote a letter to his family telling about life on his Oregon ranch. Predictive of his later run-away, at 13 Hyde left his family, stealing passage on a freight train to become a cowboy on his uncle’s ranch. “Running Wild” is an inspirational film about acting on a passion for nature and horses that has fired Hyde his entire life. It is also the story of the American wild horse. After serving in WWII Hyde eventually attended Berkeley to get a degree in English. Surprisingly, despite his love of horses, photography and ranch life, his primary goal became to be a writer. It was only to support that goal that he returned to the Oregon ranch as a manager. He reminisces that his preoccupation with writing, resulting in 20 published books, resulted in making the farm with its necessary obligations, more of a parent to his children than he was. Perhaps Hyde’s attraction to horses involves some identification with them. It’s in the saddle that even today, despite difficulty walking and breathing (he uses oxygen), he finds his greatest comfort. As “Running Wild” documents the story of Hyde, it also was masterfully edited to tell the story of the American wild horses. There were 37,000 horses, more than half of them in Nevada, running free in the ‘80’s. Since they have no natural predators, their breeding became excessive and exceeded their range capacity. Government helicopters and men on horseback worked to keep them corralled – but this was a miserable existence. The footage of these horses now freely galloping in the Black Hills Wild Horse Sanctuary is exciting to see. The yellow and red wildflowers, darkening skies, granite mountains spotted with trees and the relaxed groups of white-spotted horses is arresting. Hyde finds comfort here. It’s as if he has led 3 lives. Saddened by tragic loss and a difficulty to connect with those closest to him, these memories seem to converge in the Black Hills where he cares for his beloved horses and starts a campaign to battle a new, surprising threat to his sanctuary. The third chapter of Hyde’s life began when he was 65. But at 88, he is still able to dream and follow an inner voice calling him to further greatness through charity to those who cannot help themselves – wild horses.